Land Pride’s ‘seeding package’ is a unique blend of products that work well by themselves, and compliment each other when used together with a Land Pride Disc Harrow. This package is ideal for large grassy areas, reclamation sites, or wild game food plots. Seed Bed Roller – this is an excellent finishing tool with applications from roadside use to landscaping. The SBR will break up clumps and dirt clods while pressing seed into the soil for seed to soil contact. Electric Spin Spreader – our Spin Spreader is easily calculated for a host of seed types, many of which we have put into a seed calculation chart for you. Electrically turn on and off from your tractor or vehicle seat. 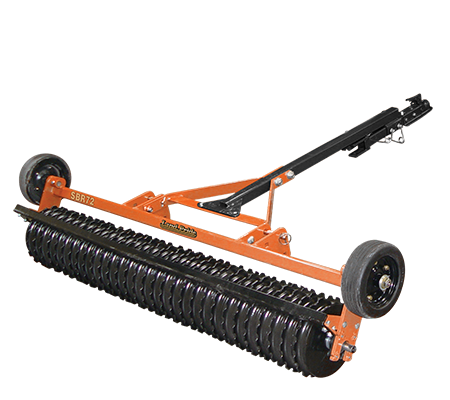 Drag Harrow – our Drag Harrow has light, medium and aggressive applications, simply by turning the harrow in different positions. Perfect for dragging a sports field or smoothing out recently cultivated ground.